Welcome to the May edition of our newsletter. This issue will feature ways that you can SAVE MONEY while keeping your cat healthy. We hope these tips will be helpful to you and your feline friend as well. Did you know that you can read past issues of our newsletter online? Just go to our website at www.cheshirecatclinic.com and click on Newsletters! In the current economy with gas prices over $4 a gallon, you might be feeling the pinch. We certainly do! So with this in mind, May's newsletter is aimed at helping you save on veterinary care. Every day, your cat is exposed to viruses in the environment; some of them, like feline leukemia virus, and rabies, are often fatal once your pet becomes infected. Other viruses, such as feline herpesvirus, calicivirus can be spread through sneeze droplets and saliva. Some viruses are even hearty enough to be carried into your home on your clothes or shoes. Keeping your cat up-to-date on vaccinations can save both you and your pet a lot of money and a lot of pain. Taking out an accident policy on your cat can help prepare you for those unexpected emergencies. There are many good pet insurance programs, such as VPI Pet Insurance (www.PetInsurance.com) Pets Best Insurance (www.petsbest.com) or Quick Care Pet Insurance (www.quickcarepetinsurance.com). Pets Best Insurance, which is approx $18/month, has a $100 deductible and per incidence $2,500 coverage. Just think how good you will feel knowing both you and your cat are protected in an emergency! Indoor cats are proven to have longer, healthier lives. Infectious diseases, such as feline leukemia virus (FeLV) and feline immunodeficiency virus (FIV) are contracted through exposure to infected cats. Removing any possible contact with infected cats will keep your kitty safe from these potentially life-threatening viruses. Your indoor cat will also be protected from many poisons, wild animals (such as coyotes and raccoons), and even neighborhood dogs. And remember, few cats ever survive being hit by a car! Every year, nearly 7 million pets are surrendered to animal shelters across the country, and most of these beautiful animals are eventually put to sleep because there simply aren't enough homes for all of them. You can help stop this tragic practice by sterilizing your cat. Allowing your cat to have kittens can also be very expensive, and altered pets are less likely to become aggressive, wander off, or urinate in your home. Altering your pets will protect them from potentially fatal conditions such as mammary cancer, testicular cancer, and uterine infections. Having your pet thoroughly examined by a veterinarian can help identify underlying problems that can be serious concerns. Catching the following problems early can prolong your pet's life and even potentially save you a trip to the emergency clinic. Your cat can't tell you where it hurts, and many health issues can be easily managed once they are identified. Blood panels are often run, especially on senior cats, to try and catch illness early. If you find the blood work is above what you budgeted for, please inquire for less expensive profiles. Remember, cats age more quickly than people, and a lot can change in a year. How old is your cat really? CLICK HERE! Your cats should only eat a diet specifically designed for their needs. So many great diets today are made specifically for cats. Some of the diets and treats available can even help clean your cat's teeth! Avoid cheaper diets that often contain large quantities of indigestible filler and can vary in consistency from batch to batch. Feeding a high quality pet food in appropriate amounts can actually increase your cat's longevity and improve their overall health. We recommend feeding cats more canned food and less dry food to help prevent urinary stones, crystals, and idiopathic cystitis. If you have questions about your cat's diet, please feel free to ask us for advice! 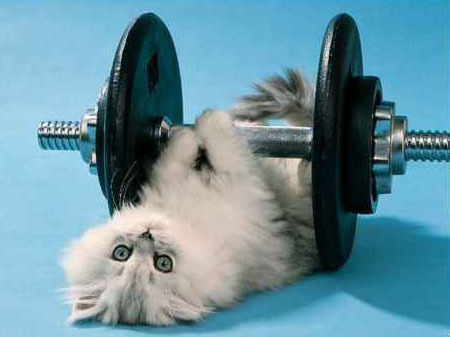 Indoor cats need exercise too! Take advantage of vertical space by getting tall kitty condos for your cats to climb. Invest in play toys to keep them busy and also stimulated so they don't develop bad habits. Indoor enrichment has been shown to help lessen the incidence of Feline Idiopathic Cystitis. 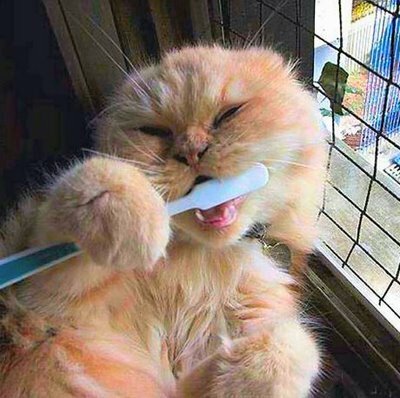 Brushing your cat's teeth frequently can help prevent serious dental disease. But if, like many people, you simply don't have the time to brush, you can still make a difference in your cat's dental health by giving them dental diets such as Hill's T/D or an enzymatic treat, such as C.E.T. Chews, on a daily basis. Home dental care can help prevent infected teeth that may require surgical extraction, and having a thorough dental cleaning performed by your veterinarian on your cat can help prevent diseases, such as heart and kidney infections, caused by chronically infected teeth. Consider scheduling a prophylaxis when it is first recommended rather than waiting. Cheshire Cat also offers a discount on dental care! One of our newest promotions is earning a $10 credit for referring a friend (and that friend gets a $10 credit off as well (for services). Ask us about the referral credit program! We are also participating in Bayer's current Advantage flea control promotion: Buy four tubes and get one free. The local stores that sell Advantage over-the-counter do not offer the free tube so our price is actually lowest. Hill's Pet Nutrition offers up to $15 on rebates for Prescription Diets (we have the rebate forms here) and also has coupons on-line at (http://www.hillspet.com/products/products-special-offers.html). You may want to search on-line for coupons of other products or diets too. Care Credit is a third party financing company that offers deferred interest payment plans through some veterinary hospitals, dentists and cosmetic surgeons. You can apply for the card on-line at www.carecredit.com and use it for transactions over $300. Care Credit offers promotional rates of 0% interest for 6 months as long as the balance is paid in full by the end of the term. That's a savings over your regular credit card! We stock several medications, diets and products for your convenience and because some veterinary medications can't be found at human pharmacies. However, large corporate pharmacies may stock some of the same medications we prescribe for your pet at a much lower price. Larger pharmacies have the leverage to purchase the medications at a special bulk rate that is not available to small businesses like ours. We are happy to provide you with a written prescription for you to fill elsewhere. We hope that these tips can help save a little during these tight times. If you have any questions, please feel free to call us!